I needed to do a repair in exhaust service. Specifically on my '81 F150 with a 351 M engine. Ford, in their infinite wisdom, put a "frost plug" on the back end of the drivers side cylinder head that connects into the rear exhaust port. Well, of course, it had given up and was leaking and making a unpleasant noise. There is about 1 1/2" clearance to the firewall. So, what to do?? 1. Remove the cylinder head. 2. Slide the engine ahead enough to get to it. 3. Try some "backyard engineering"!!!! 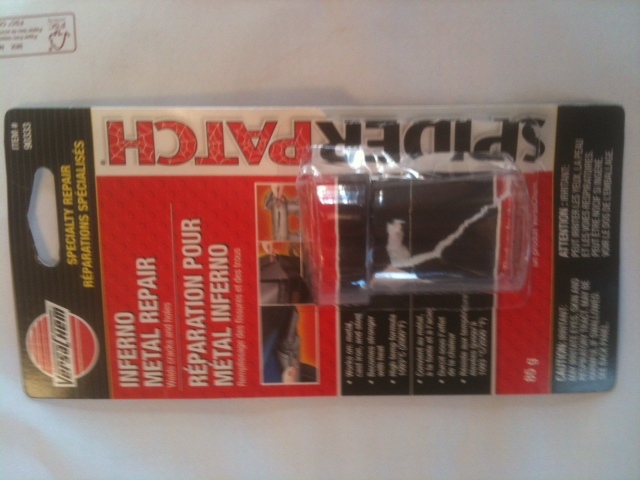 So I went to the autoparts store (in this case Canadian Tire) and perused the rack of sealers and found "Inferno metal repair". Rated to 2000 degrees F, rated to 700 psi tensile strength, and machinable . It contains chromium and nickle. It is a single component that air dries. So I gloped what seemed to be a suitable amount into the hole and then inserted a 1/4" lag bolt to hopefully increase the strength of the repair. After 3-4 hours I am supposed to "gradually heat for 10-15 minutes". So I guess in a few hours I will start it up and let it idle for 10 minutes. Then let it sit overnight and find out. Anyway I am posting this because on the T I have encountered otherwise good blocks that are pitted around the exhaust ports and exhaust manifolds that are also pitted badly there. It may also be good for "cosmetic" repairs to otherwise good exhaust manifolds. Anyway for less than $10.00 it seems worth trying!! Les, for what it's worth. I have replaced those plugs by using a hole-saw to make a hole in the firewall. Same year truck, same engine.